Procraftination: Dynamic Duos Challenge #52 - DD 1 Year Anniversary Challenge! 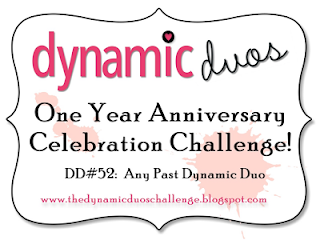 Dynamic Duos Challenge #52 - DD 1 Year Anniversary Challenge! See what I mean? You get to choose from any of the past Dynamic Duos challenges for this week's project. So much to chose from that you may want to play along more than once! I chose DD#6 for my card. Loved the gray and rose colors together. They really pop! Since I don't have any Regal Rose (sadly), I used Rose Red. I'm so pleased with this combination and I really had fun with this card. I used a "new to me" stamp set from Lawn Fawn. I couldn't resist that sweet tea cup. Well, and everything else in the set. I admit it. Also, I HAD to use that new ribbon from Stampin' Up!. It's the Basic Gray Two Tone 1- 1/4". So soft and so pretty! I've added a few highlights to my images with a Stardust Clear Glitter pen. It adds such a nice shimmer. I hope you'll play along with us at Dynamic Duos this week and help us celebrate our 1st Anniversary! 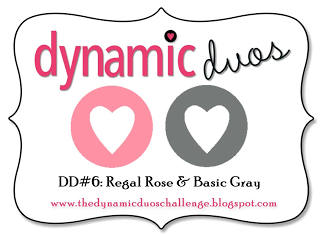 Now, pop on over to the Dynamic Duos blog. Take a look at the challenge details AND see what the rest of the team has created. Ok? What an appropriate sentiment to use for our challenge this week. I like how you turned the ribbon under as a loop at the top, so clever! Very pretty card! Love how you used ribbon for your fishtail banner. Gorgeous colours together and such an elegant design, I especially love how you have used the ribbon! Awesome clean card and the ribbon shooting out the top is perfect Susie. Love the sentiment and the image too. Works so well with these colours. Great pick for the colours - I loved this one too. Love the design of this card and the little details! Susie love that colour combo, that one was my second choice. Lovin that Lawn Fawn stamp. Gee blog hopping is costing me a lot of money these days.